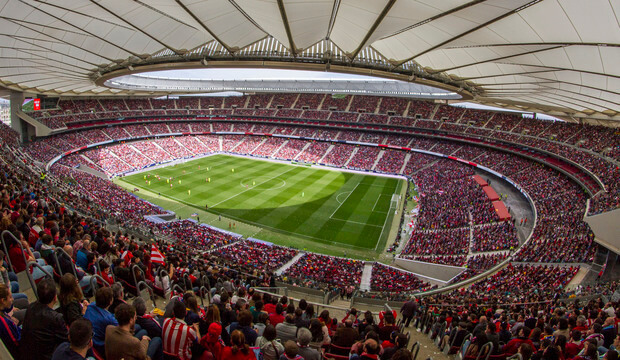 A record crowd of 60,739 watched a women’s football match between FC Barcelona and Atletico Madrid at the Wanda Metropolitano on Sunday, less than three months before the start of the FIFA Women’s World Cup. The attendance is the largest ever for a top-flight club match in European women’s football. ‘An historic record attendance for a club match … Today we have at the Wanda Metropolitano 60,739 spectators!” read a post from the club’s official Twitter account. ‘The crowd cheered up our girls and set a world record for attendance at a women’s club match,’ Atletico added in a statement. Barça won 2-0 as goals from Asisat Oshoala and Toni Duggan mean the Catalan team now sit just three points behind Atletico at the top of La Liga Femenina. The attendance exceeds the previous European record set, also in Spain, on 30 January, when a crowd of 48,121 turned out to watch Athletic Bilbao play Atletico Madrid at San Mames stadium. The overall record for women’s football remains the 90,185 spectators – although it was for the final of the 1999 World Cup at the Rose Bowl in California, when the United States beat China. This year’s World Cup in France will begin on 7 June. Spain have qualified and will be in Group B, with Germany, China and South Africa.